Above pricing is indicative based on the most cost effective decoration method (e.g. laser engrave to 1 position) within standard turnaround times. Setup and freight cost is additional, order is subject to current stock availability. Express service pricing available on application. 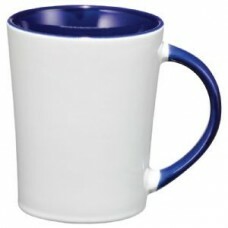 White ceramic mug with colour lining and handle. 410ml capacity. Available in black, red or blue. From high quality glassware to the more personal travel mugs and drink bottles that will be used exclusively by the recipient, our Pink Rhino Promotional Merchandise drinkware items will leave a great impression as a corporate gift or promotional giveaway. The longevity and functionality of these items will see your recipients exposed to your brand on a daily basis and keep you top of mind. Please enter your details to save your cart.